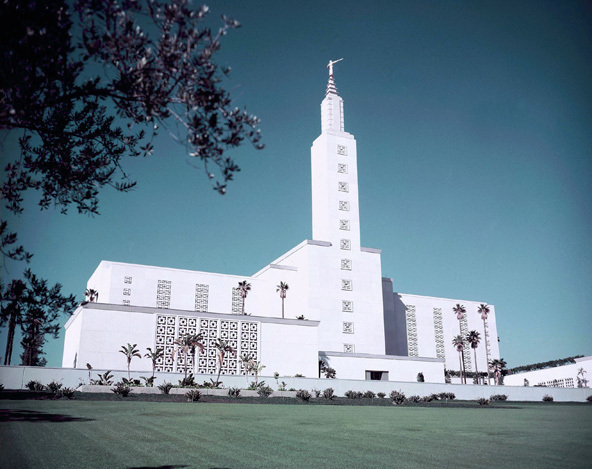 Hal Filan/Associated Press The Los Angeles Mormon Temple in 1956. Visible from so many angles, it’s L.A.’s own version of the Chrysler Building, with a couple of caveats: no pedestrian access and only its members allowed inside. The Los Angeles Mormon Temple, like a secret fortress on a hill behind a large expanse of perfectly manicured lawn. The Modernist, slightly Deco, somewhat gothic structure has no easily definable style of architecture, unless you were to coin one: Mormonesque. It’s been there almost all my life (the temple officially opened in 1956), a forbidden structure, the architecture of which was so impressive, the grounds so well kept, that one couldn’t help but want to walk on them. The temple itself is 190,614 square feet; the grounds 13 acres; and, at the top of the building, its gold statue of the angel Moroni (it’s hard not to comment on the name) 16 and a half feet, proudly blowing its horn, a beacon and a sentry for all to see. Just not up close. And a few weeks ago, I couldn’t help it — I drove in. Even the long drive to the parking lot behind the temple, up a big hill into an oasis of calm and serenity, was a little awe inspiring. Unlike that of the temple, the architecture of the visitors’ center itself is strangely curved and best described as Long Beach aquarium-like. The interior of the visitors’ center is also not what I would have expected, at all. High-tech flat-screen displays; interactive, hands-on, museumlike, elaborately produced photographs and films; and an extremely impressive (maybe 22 feet high) statue of Jesus as you enter, palms up, replete with visible holes from the cross and, behind it, a modern scrim version of the heavens. A comforting belief in a way, I suppose. I turn to find a cleareyed, gray-haired man wearing a conservative jacket and a pair of slacks, who tells me that his name is Elder Grover. It takes me a moment to realize Elder is a designation, not a first name. We are standing in front of an interactive screen with images of the interior rooms of the temple, the sealing room, the baptismal bath, which is called a “font,” surprisingly primitive art-like, in the American sense of the word, as it rests on 12 carved oxen, which represent the 12 tribes of Israel. I ask him his name again just to make sure that I’ve heard him correctly. He repeats, “Elder Grover, you know, like in ‘Sesame Street.’” I tell him that I used to work at Sesame Street as an editor in the toys and games division. He tells me that he’s bought a couple of Grover hand puppets on eBay. My visit to the Mormon Visitors’ Center was before the first presidential debate, so I do not ask him his opinion about funding for “Sesame Street.” (Fun fact: Joseph Smith, the founder of the Mormon Church, ran for president of the United States in 1844 as an independent candidate. The Democrat James Polk was elected.) I do ask Elder Grover if Grover is his first or last name. Last. He leads me through a catacomb-like hallway into an elaborately domed room. In one corner there are bookshelves on which are prop versions of the Dead Sea scrolls, and, across a huge wall, an interactive screen entitled “Where Jesus Walked,” which in its screen-saver mode is a panoramic view stretching from the site of The Mount of Olives in Jerusalem to what Elder Grover tells me is a reproduction of King Herod’s Temple, explaining that it was originally King Solomon’s Temple but was rebuilt by King Herod after being destroyed. “Be careful you don’t get vertigo,” Elder Grover warns me as he leaves the room. “I don’t have vertigo,” I answer, puzzled by the comment. But as I stand there staring at the image of the temple and its surrounding sky and landscape, it starts to change from day to night, replete with an extraordinary moment: as the bright red sun sets behind Jerusalem, fires appear in two of the doorways (or windows?) of the temple and the sky fades out and goes to night time. It is weirdly reminiscent of the Forum Shops Mall at Caesars Palace in Las Vegas, where, if you stand long enough, the ceiling changes from day to night and the stars above begin to twinkle. Four films available on this touch screen, including the final Passover meal, were extraordinarily well produced and expensive, with some of the images in “Reenactment of Jesus’ Death” so graphic, I had to turn away. (For a second, I thought it was Mel Gibson’s film, but then I realized it was in English.) The high-tech screens and interactive media were so in contradiction to the almost nascent sculpture garden that I felt off balance, as if I had a bit of vertigo. As I start to leave, a painting on the wall stops me. It is the only piece in the room that has neither an artist’s attribution nor a caption. It is a landscape of a river, a riverbank in the forefront with palm trees, a river and a view across the river of mountains on the other side. I used to have a recurring dream when I was a child. The image in my childhood dreams was identical to the landscape in the painting. It was always the same landscape except occasionally (in certain variations of the dream), there would be people on the riverbank and, sometimes across the river, there would be people and houses on the other side. Nothing ever happened in these dreams. It was as if I were an observer looking at a landscape. I’ve puzzled over it often, trying to figure out its meaning, trying to decide if it had any spiritual context. It even occurred to me once that it might be heaven. And there it was on the wall, my dream, the landscape in my dream, in its natural state with no houses on it and no people on the riverbanks. No signature on the painting, no inscription, no caption underneath. There is no gift shop at the Los Angeles Mormon Temple Visitors’ Center. The only postcards available are preprinted with its address in case you desire additional information.